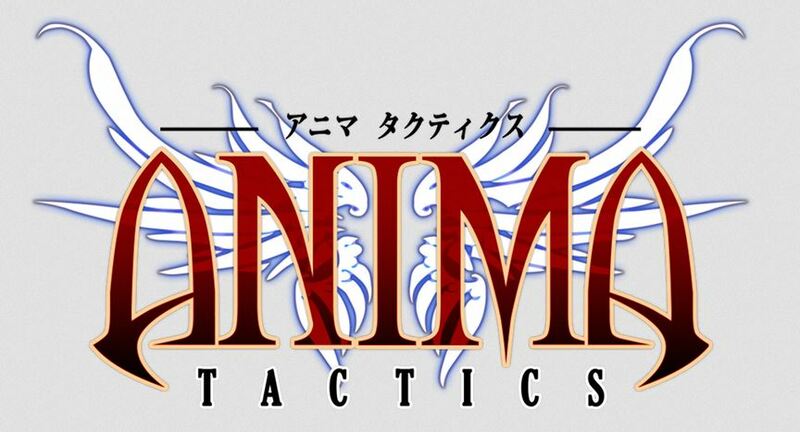 Ninja Division, who had recently taken over Cipher Studios properties, has announced that they're going to be discontinuing Anima Tactics. Hell Dorado will also no longer be available through distribution. Also, the Cipher Studios web store will be closing on March 13th, with all online sales to be done through Ninja Division. 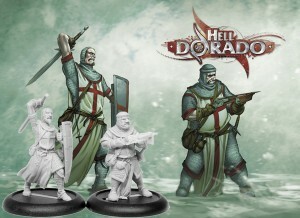 Ninja Division has taken over distribution and releasing of Cipher Studios' Hell Dorado mini. 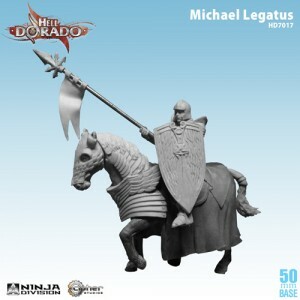 Check out the new knight releasing next. Cipher Studios has posted up a preview of the Efrit Warriors they're working on for Hell Dorado. The Inferno book is in my hands right now and it is glorious! So we’re going to kick off the year with some more Hell Dorado goodness in today’s deCiphered. We’ve known what these guys were going to look like for a while now, but with the delivery of the Hell Dorado Kickstarter rewards, we’ll actually be seeing these guys hit the table quite a bit in the coming days. So what do these little 15 point flame dancers do for your company? Turns out, quite a bit. Cipher Studios shows off their upcoming October releases for Hell Dorado and Anima Tactics. Cipher Studios gives everyone an update on their Hell Dorado Kickstarter campaign and shows off the Twilight Knight mini. The Inferno book is going off to the printer Monday. The revised Core book and cards will go off later in the week. After the files are reviewed by the printer we'll be able to get a good handle on the delivery date and will update when we get it. We will send out the PDF invites for the Inferno book to those at the Hell Gate and above levels near the end of next week. Everyone has been wonderfully patient and we greatly appreciate it. We are very ready to get this baby out! Cipher Studios is showing off some new artwork and fiction for Hell Dorado. 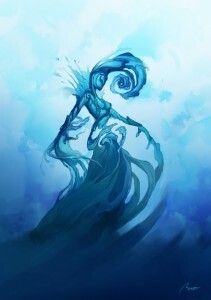 This one's the Djinn Haadiya al Furat. Hi all, welcome to another installment of Tales From Alamut. This week I have the privilege of previewing a new character from Hell Dorado: Inferno. I give you The Djinn, Haadiya al Furat. 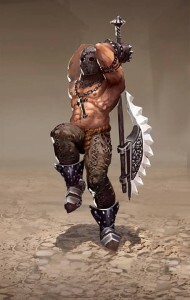 Cipher Studios is showing off a new Hell Dorado art preview with a look at the Executioner. It's Friday the 13th. Perfect day to reveal this fellow! 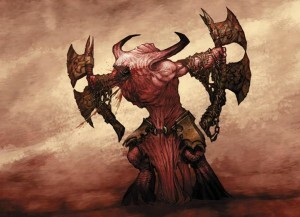 The Executioner stalks the lands of Hell, leaving a trail of blood and death in his wake. He does his grisly work in the name of Christendom, and gives no heed to non-believers. His axe is the inexorable specter of death, and even the most twisted entities fear his countenance. Cipher Studios gives us a look at some new greens they're working on for Hell Dorado. They're showing off the Quetzalcoatl as well as Leblanc. Couple of in-progress shots of the Quetzalcoatl sculpt. 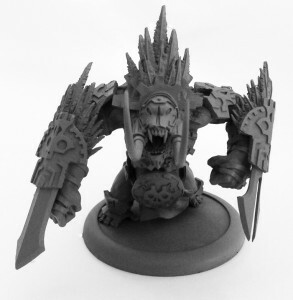 This guy’s gonna be huge when he hits your table! Cipher Studios shows off some new preview artwork for upcoming models for Hell Dorado in their latest update. Got some exciting new Hell Dorado concepts to give you the chills. Cipher Studios gives us a look at what's coming up for Anima Tactics in July with a quick preview. 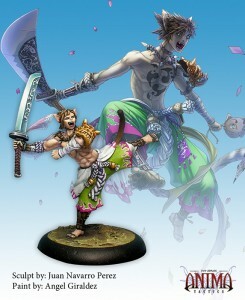 Got some new Anima Tactics models on the way in July! 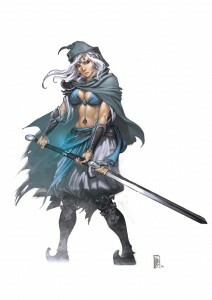 Cipher Studios has some new releases up for Hell Dorado and Anima Tactics up on their website. We’ve got some new releases on their way to distributors now. For Anima Tactics, we have Medeus. This neutral faction sorcerer lends his arcane power to the non-human forces of Samael. 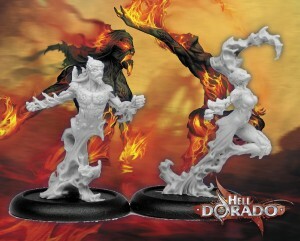 On the Hell Dorado Side, we have one of the new releases for the Hell Dorado: Inferno set. Those of you who watched our Kickstarter will already be familiar with these models. Cipher Studios is in their final couple hours over on Kickstarter. They've blown away their original goal. Can they get even higher before the clock ticks zero? We're knocking down the stretch goals and we're about to hit 6 digits with over 800 backers. I've been crazy busy at the GAMA trade show and have some good news. Cipher is working with Battlefoam to design a Hell Dorado branded carrying case. You'll be able to buy a bag specifically designed for the needs of the Hell Dorado gamer. This will also be a great place to put your Hell Dorado patch! Stay tuned while we get the design worked out and create the perfect bag. We're also revealing our next big stretch goal. If we hit $115,000 we will make a Core Hardcover Rulebook available for upgrade or Add On. Cipher Studios is teaming up with Kingdom Death on the Hell Dorado Kickstarter. Now you can add a special Twilight Knight to your Hell Dorado pledge. We are very excited to partner with Kingdom Death to bring our two brutal worlds together with the Pinup Twilight Knight's descent into Hell. This amazing Special Edition figure re-imagines the Pinup Twilight Knight as she would manifest in the realms of Hell Dorado. The concept art was illustrated by legendary artist Bertand Benoit (Rackham & Helldorado) with some key art direction provided by Lokman Lam (the artist behind the Pinup Twilight Knight). Sculpting this beautiful figure will be the famous Thomas David. Cipher Studios is doing well with their Hell Dorado Kickstarter campaign. Here's a look at what they've got in store as the time runs on. With 11 days still to go, the $55,000 Token set stretch goal has been met! 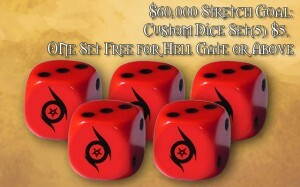 We are now announcing a new stretch goal for a set of custom Hell Dorado d6. Contributors at the Hell Gate level or above will all receive a set for free! Contributors at lower levels may purchase a set as an add on and additional sets may be added on at a cost of $5 per set. Plenty of time left, let’s hit that goal! Cipher Studios shows off a pair of Efrit Warriors they're going to be coming out with for Hell Dorado. Here’s a quick sneak peak of the upcoming Efrit Warriors sculpts from the Kickstarter! Head on over and contribute to get yours today! Cipher Studios has 2 weeks left on their Hell Dorado campaign. 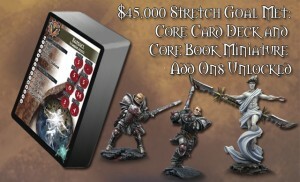 They've added in some stretch goals that will bring you guys tokens and template sets. Everyone loves tokens and templates. Cipher Studios has just added a new Template and Token set created by Gale Force 9 as a stretch goal to the Hell Dorado Inferno Kickstarter project. We need $5000 more to make both of these available, but there's still 15 days to go, so there's plenty of time to get one of these sets for yourself before they hit stores! Cipher Studios has updated their Hell Dorado Kickstarter to add new core decks and figures to the offerings. We made it to the Core Deck of cards stretch goal including all the cards from the Core Hell Dorado Rulebook! There are over 150 cards for the Core Rulebook so this will be a hefty deck. By popular demand we've also unlocked every figure from the Hell Dorado Core Rulebook. The entire range of gorgeous and gruesome figures is now available to all our backers. Cipher Studios has already made more than double their goal on Kickstarter for their Hell Dorado expansion, unlocking new minis for the campaign. The Hell Dorado Inferno Kickstarter is well past the 200% funded mark and we have just unlocked the Free Alternate or Limited Edition Add On Sculpt for Hell Gate pledge level and above. 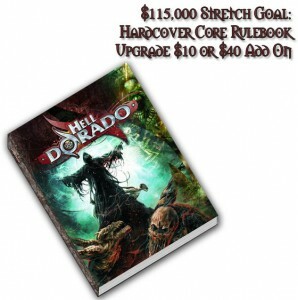 Come check out Hell Dorado Inferno and see the upcoming stretch goals! Cipher Studios launched the Kickstarter event for their Hell Dorado: Inferno expansion. The INFERNO expansion book and card deck is the first major expansion in the Hell Dorado universe. The greatest war of Hell has escalated to new heights of destruction as the demon Legions under command of the Fallen Angel Abezeth rise to eradicate the upstart invaders from Lucifer's realm. The INFERNO expansion book includes 48 new profiles across all six Hell Dorado Factions. This full color book will also feature: New Scenarios, new battlefields, and new terrain types to make your games more exciting than ever before. Hell Dorado: Inferno will give players more army strategies, more game variety, and more of the miniatures that make it one of the best looking miniature games around. The expansion also includes a card deck for all the units that are included in the book for use in the game with your models and as quick reference of your opponent's forces. 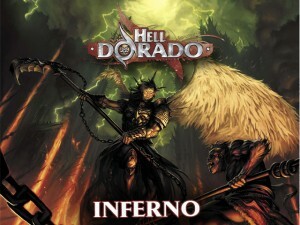 Cipher Studios announced that they're going to be making a new expansion for Hell Dorado called Inferno. They're going to be running a Kickstarter campaign in order to fund the project, which will start soon. I am going to postpone my painting article because I thought this would be much better especially as the Hell Dorado Kick starter is just around the corner…. Each faction looks to be getting 2 new officers and they are amazing! A lot of thought has gone into these new officer and each adds new elements to the various factions and new play styles. I posted the concept art for Guillaume a few months ago. So nice to see how awesome the sculpt came out! Ciphper Studios didn't get Kudoi out with the rest of the Anima Tactics releases, but he's available now. 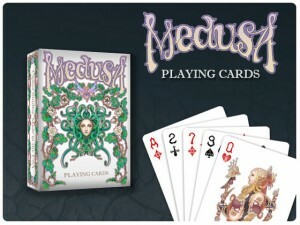 Cipher Studios got their Medusa playing card decks funded over on Kickstarter. Still 4 days to go if you want to get in on the action. We did It! The deck has met it’s funding goal. I want to thank all those who backed it and spread the word. 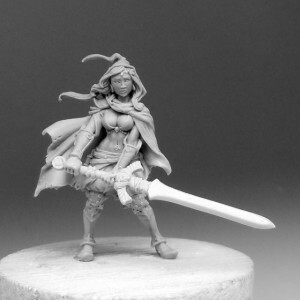 Cipher Studios has released 3 new models for Anima Tactics over in their webstore. Go check 'em out. Kira, Frederick Adler, and Type-020: Verrier for Anima Tactics are now available from the Cipher Studios web store. In time for the Halloween sale! These have also been working their way through the distribution chain so they should be available soon at a fine hobby game store near you.